Heat oven to 400°F. Grease cookie sheet with shortening or spray with cooking spray. Insert toothpick into narrow end of each wiener. Separate dough into 10 biscuits; carefully divide each biscuit horizontally into 4 rounds. Wrap sides and top of each wiener with dough round, pinching edges to seal. In pie plate, mix egg and milk. On a plate, mix cornmeal and sugar. Roll each wrapped wiener in egg mixture, then roll lightly in cornmeal mixture. Place seam side down on cookie sheet. Bake 10 to 12 minutes or until tops are light golden brown and bottoms are golden brown. Remove from cookie sheet with spatula. Serve with ketchup and mustard. Even if the dough doesn’t wrap perfectly around the weiners, it will come together during baking. 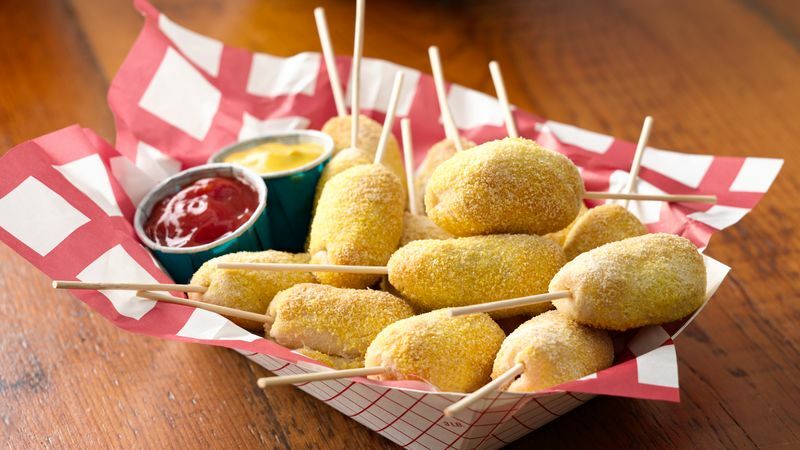 Add a kick to these mini corn dogs by stirring 1/8 teaspoon ground red pepper (cayenne) into the cornmeal mixture.